Jamie Aldridge has been a writer and editor since 2005, contributing to the "The Observer" and "Seniors Today." He has also worked as a nutritionist and research technician for the Food Standard Agency. Aldridge holds a Bachelor of Science in nutrition and a Master of Research in clinical practice. 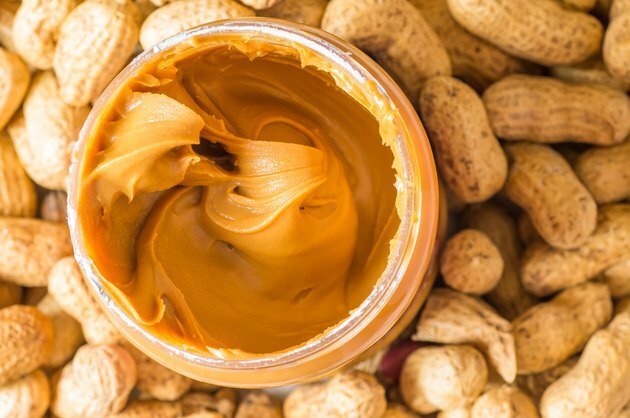 Peanut butter could either cause diarrhea or help treat it. The Cleveland Clinic recommends low-fiber food such as peanut butter to help manage diarrhea without medication. However, if your son suffers from a peanut allergy, he could develop diarrhea within minutes of consumption. In this event, life threatening side effects may occur; therefore, consult a doctor if you suspect your son is suffering from an allergic reaction to peanuts. Drink fluids frequently. Choose smooth fruit juice, water, soda and sport drinks. Try to avoid drinks with caffeine and alcohol. Rather than drinking with meals, Cleveland Clinic recommends drinking fluids between meals. Along with peanut butter, stick to low-fiber foods such as yogurt, rice, noodles, grape juice, bananas, applesauce, white bread, chicken or turkey without the skin, ground beef, fish, cottage cheese, and cream cheese. Peanuts are one of the most common foods that cause an allergic reaction according to KidsHealth. Peanut allergy occurs when your immune system mistakes proteins in peanuts as something harmful to the body. The immune system releases chemicals, or antibodies, to fight the proteins, which causes the symptoms. So much as touching, inhaling or eating trace amounts of peanuts may cause an allergic reaction. Peanut allergy symptoms are usually immediate, occurring within minutes of contact. Symptoms vary from mild to severe reactions. Peanut allergy symptoms include skin reactions such as hives, redness or swelling, as well as itching and swelling in or around the mouth and throat, digestive problems such as diarrhea, stomach cramps and nausea, tightening of the chest, sneezing or shortness of breath and a runny or blocked nose. The best defense is avoiding peanuts and foods with peanut traces; however, this could be difficult. Antihistamines may help relieve some symptoms such as itchiness or hives. For a severe reaction, an immediate injection of epinephrine may help reverse symptoms. An EpiPen is the device used to auto-inject the medication; it is available under prescription. MayoClinic.com recommends you carry it at all times and learn how and when to use it from your doctor.